← What can be found on the World Wide Web? If your job is going to the wrong printer, it may be set as the “default printer” in error. Open up Printers in the Control Panel and use this picture below to check where the black tick is ! 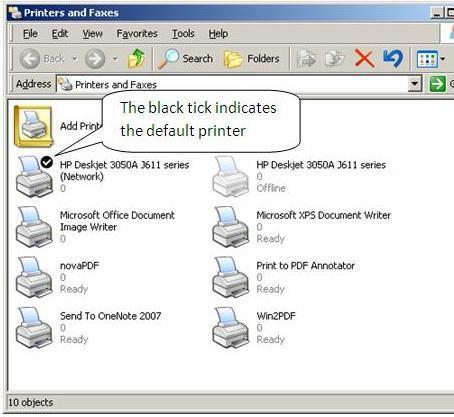 If the black tick is on the wrong printer, click on the one you want, click with your RIGHT mouse button (to bring up a menu) and choose “Set as default printer”. The black tick will move to it ! Posted on March 15, 2014, in Troubleshooting Zone and tagged control panel, default, printer, printing, windows. Bookmark the permalink. Leave a comment.